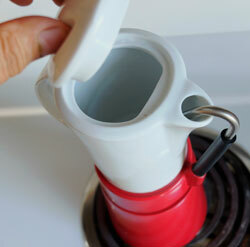 Aerolatte Cafe Porcellana Stove Top Espresso Maker. Our review of the Aerolatte Cafe Porcellana. First of all... many thanks to Igor Dernov at FrenchPressCoffee.com for sending us this espresso maker. As you’ll see in the video, the Café Porcellana is based on the classic Italian stovetop espresso makers made famous by Bialetti. But this espresso maker comes with a totally different design. Instead of the top chamber of the brewer being attached to the lower chamber, it’s quite separate. And it’s made of porcelain – hence the name “Porcellana”. Waiting for the espresso to come up into the top chamber. As with other stove top brewers, it makes a very acceptable espresso, which you can drink as it comes, or use as a base for making a latte, cappuccino or café au lait. 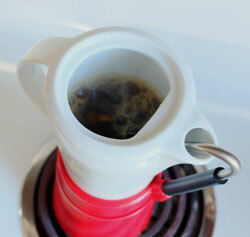 Does it make better espresso than its Bialetti cousins? I don’t think so. But I don’t think that’s the point either. The point of the Café Porcellana is to make the same quality of espresso, but do it with a look and design that is both striking and original. Choosing this espresso maker over another, with a more traditional look, is a choice you make to suit your own esthetic tastes and preferences. Myself, I really like the look of this espresso maker, as does my wife. We chose the red model. But you can also get it in black. 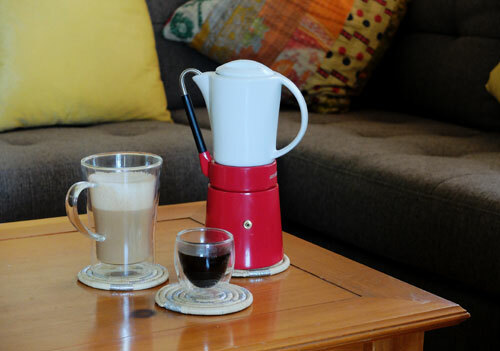 Both models come with the same white porcelain coffee pot. If you want to get one, you can find out more and buy one through the FrenchPressCoffee.com website. You can use the Aerolatte Cafe Porcellana for making straight espresso, or then use the espresso as a base for a latte or cappuccino.